When I was a kid, my twin sister and I would wake up around 4:00 am on Christmas morning. We would tiptoe out to the living room to check out what Santa had brought us. Then we would go back to our bedroom (sometimes dragging our gifts with us) until about 6:00 am. 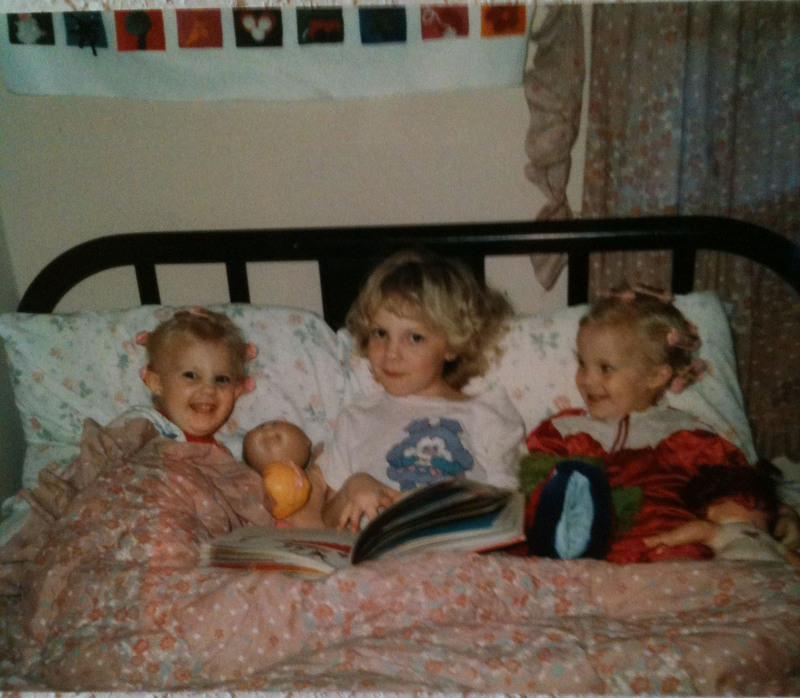 When we could no longer contain our sheer excitement, we would pounce on our older sister and wake her up. I don’t remember ever actually going into my parents’ bedroom, but I’m sure we were loud enough to wake them up by 6:30 or 7:00. My dad was always grumpy, my mom was always taking unflattering pictures of us- especially once we entered the “awkward phase.” By 8:00 am we were pretty hungry. We would always beg mom to make us some chocolate chip pancakes. That was the tradition of Christmas breakfast, although I think it came about by accident. Now that I have two daughters of my own, I want our Christmas morning breakfasts to be just as memorable a tradition for them. I searched Pinterest yesterday for breakfast ideas to start a new tradition, but I couldn’t really find anything that just really called my name. When I got home from work, my husband had purchased Christmas themed pancake molds. Thank you, honey! New tradition has started!! What do you like to eat on Christmas morning? What fun family traditions keep your heart warm and full this time of year? This picture may not be Christmas, I’m not really sure, but it is about 1987 I think. Christmas is 8 Days Away? I cannot believe that Christmas will be here in only 8 more days! We have had a very fun December with our little girls doing Elf on the Shelf and an Advent Calendar. Amelia (my 4-year-old) gets so excited each night to read her Bible verse and do her little activity. Sophie has no idea what’s going on, but she has started blowing raspberries and squealing, which is always cute. If you have a woman in your life and you don’t yet know what to get her, you’re probably in trouble. BUT scented bath products are always a good bet. If you are still scrambling, may the force be with you! I received a phone call last week that could have really put a damper on my holiday season if I were not a natural born skeptic. The “gentleman” on the other end of the line identified himself as an officer with the Stillwater Police Department. He told me there was a federal investigation into my name and my life and asked if an officer from Stillwater or Oklahoma City had contacted me the previous day to confirm. I told him no and he asked me to hold. Another man picked up the line and identified himself as Brock Something-or-Other, also with Stillwater PD. He was not as polite as he read through my “affidavit.” There was a lot of legal mumbo-jumbo that I didn’t really understand but at the end he asked if I wanted to “take care of this now.” I knew what he meant: payment. He had basically accused me of not paying my taxes for 2013. He kept saying the word “taxes,” so I assumed income tax. It was not until I asked for clarification that he said the words “education tax for the school-year 2013-2014.” He said I could take care of this over the phone or I would be arrested. Wait….. Whaaat?! Yes, education tax for school year 2013-2014. Um, there’s no such thing as a federal education tax. I informed him that I would not be giving him any information over the phone. Period. He then called me a very ugly name and told me I would be going to jail. Immediately. And he hung up the phone. Welp, that gave him away as a SCAMMER! I know he was targeting OSU students and trying to scare them into giving him a credit card number or bank account information. So, how can you avoid the trap? It’s really, really simple. Do not give your personal, financial information to anyone who calls you. I would think that no reputable company would call you to obtain payment. They would send you an invoice. If someone does call you asking for payment over the phone, tell them you’ll call back. Don’t take the number from them. Try to find it through the yellow pages or some other trusted source. Also know this: The police will not come and arrest you and take you to jail for non-payment on a debt. If you are truly defaulting on payments for something, you will be served a legal summons to court, then go through the court system before any legitimate threats of jail time could be made. Scams of this type seem to increase in frequency around the holidays. It may be because it’s the end of the year (close to tax time). It may be because people are more vulnerable due to a more hectic social schedule. I don’t really know why… Please be alert. Please do not fall victim to such an obvious scam. Just remember: DO NOT GIVE OUT PERSONAL, FINANCIAL INFORMATION OVER THE PHONE. Especially if the person requesting it called you!